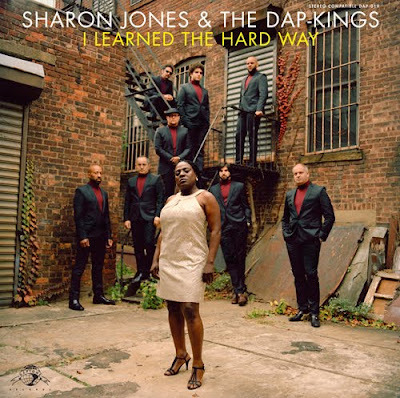 Sharon Jones & the Dap-Kings are already well known as one of the most exciting acts in the nation for both their explosive live shows and their prolific output of gritty studio recordings. Their third release, 100 Days, 100 Nights , sold over 100,000 copies in the US alone. On Jones’ birthday this year, the band will release their fourth full-length, I Learned the Hard Way, on Brooklyn’s independent Daptone Records. The record marks a bold step forward for a band who almost singlehandedly stewarded today’s return of soul music to its more traditional sound. Produced by Bosco Mann and recorded on an Ampex eight-track tape machine by Gabriel Roth in Daptone Records’ House of Soul studios, the record drips with a warmth and spontaneity rarely found since the golden days of Muscle Shoals and Stax Records. Sharon’s raw power, rhythmic swagger, moaning soulfulness, and melodic command set her firmly along side Tina Turner, James Brown, Mavis Staples, and Aretha as a fixture in the canon of soul music. From the lush Philly-Soul fanfare that ushers in “The Game Gets Old” at the top of the record, to the stripped down Sam Cooke-style “Mama Don’t Like My Man” at the tail, the band dances seamlessly through both the most crafted and simple arrangements with subtlety and discipline. This is the “Daptone Sound” at its finest.